Last night, I was feeling pretty ropey. My feet are outrageously painful, although I’m not sure why. I don’t have any injuries, but my knees hurt and my feet are like balls of fire. I suggested to Chris that we get a bus to Land’s End, drop our bags and walk back and return by bus. 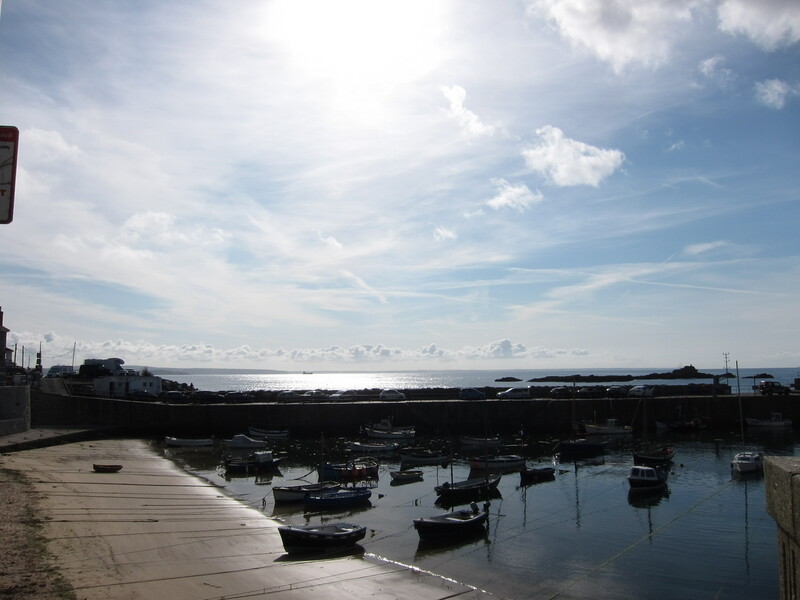 This morning, however, things seemed better, so we took a bus to Mousehole (pro. MAW- zl). This will leave me with the Porthleven to Mousehole stretch to do, which is about 10 miles of mainly road. It seemed a bit mean to drag Chris all the way here just for road-bashing. Mousehole is a delightful village. Much more real than some of the others, with proper fishing boats and actual residents, not just holiday homes. The sign posting of the route is as poor as ever. The path is tough at this point. There is some scrambling round rocks at the end of the various headlands, I am glad to have done them in good weather – it was a beautiful day. 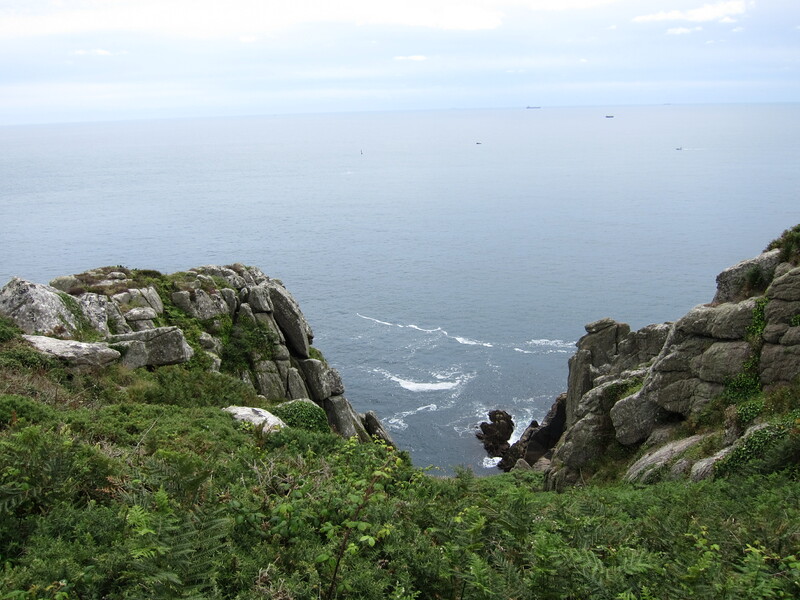 It took a couple of hours to get the 2.5 miles to Lamorna, so we rewarded ourselves with coffee and cake. There was then another tough section, lots of exposed cliff, with suggestive names, such as Coffin Rock. We met various people coming towards us, including a Swedish couple, both 72 who do this section off the path every year. Startlingly, she was in a bikini. And only just in that. She was busy tucking herself into the top when she heard us coming. It is hard to imagine members of the Ramblers Association being quite so free and easy! By the time we reached Porth Berth, another 5 miles, I was completely exhausted. I really don’t know what has got into me – I am never normally tired. I hope I am not sickening for something. As we rested, we chatted to some very fit looking ladies who said that the next sections were very up and down with some scrambles. I knew I couldn’t do it. We debated the merits of pub and taxi, then decided on a cross country route, flatter, across the fields. It took almost as long, as the path was frequently hidden under crops, which necessitated endless stops to look at the map but it was easier. Annoyingly, I left my large water bottle in the pub where we ate last night, so I only had a small bottle of water, which I had refilled at Lamorna. We took several false turns. 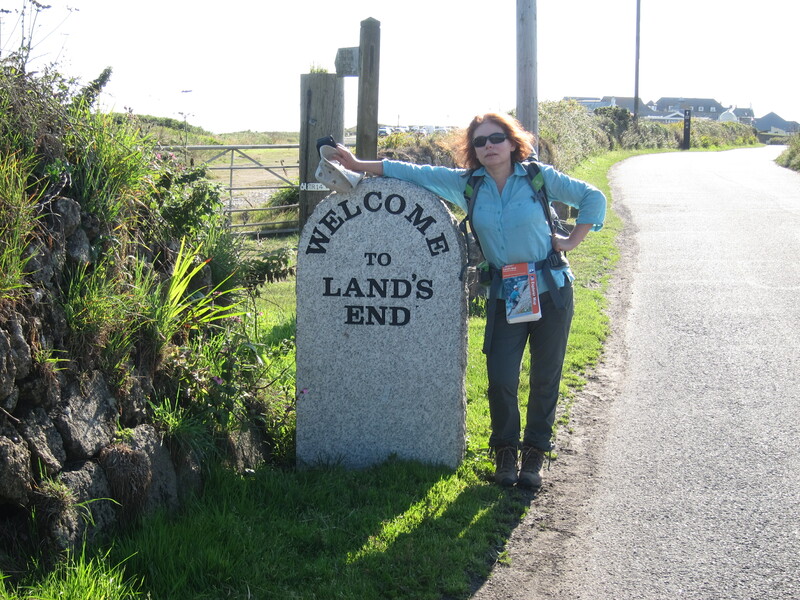 Eventually, we arrived at Land’s End. The weather was still fabulous. We had a good meal, and Chris has gone off to his b & b (he’s come prepared to camp, but there are no pitches available. The receptionist here is fantastic. She found Chris a room , and has organised a taxi to collect my bag in the morning and ferry it to my hotel for tomorrow. I cannot contemplate walking with a full pack any more, especially as the forecast is for rain, which will make for slippery surfaces. My knees are shockingly painful as I go down steps. Hopefully, with just my wet weather gear, sweater, money and phone, I’ll be able to manage. 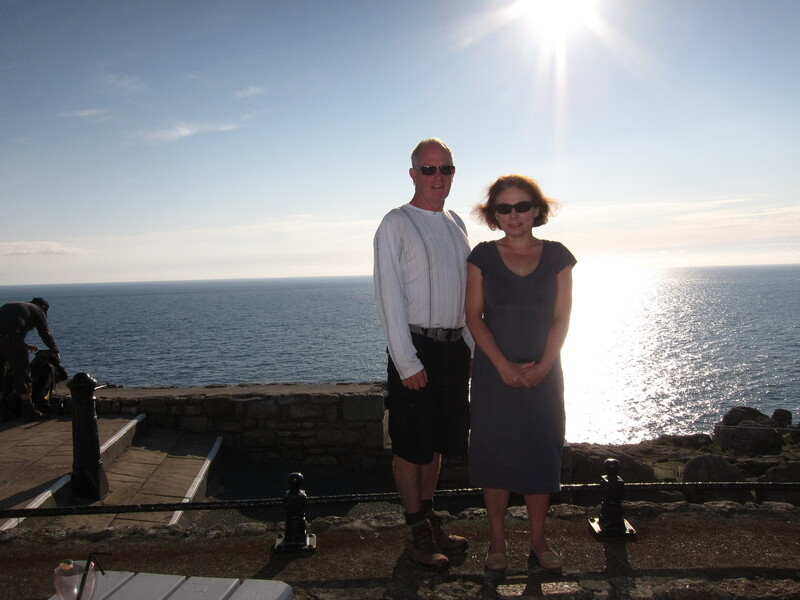 This entry was posted in Cornwall and tagged Land's End; South-west. Bookmark the permalink.